Contain onion odors while keeping cut onions fresh and moist. 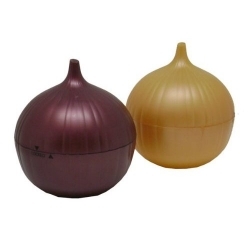 Made to look just like an onion, this will never be lost and forgotten in the fridge. Made of plastic, the 2 sides attach by twist lock. Airtight and dishwasher safe. Colors vary, orange or purple.